Paris attacks on November 13 reportedly occurred at multiple sites across the French capital. Le Bataclan is an old 19th-century variety theatre that in recent years has been run as a rock venue. It’s located on the boundary between two hip, densely populated neighborhoods full of bars, restaurants, and cafés that would likely have been very busy at the time of the attack. Built for the 1998 World Cup, the Stade de France is France’s largest stadium, a huge venue seating more than 80,000 that dominates the Saint Denis Quarter. The location itself is just outside Paris Proper beyond the Boulevard Périphérique Beltway, in a lightly populated quarter dominated by major roads. 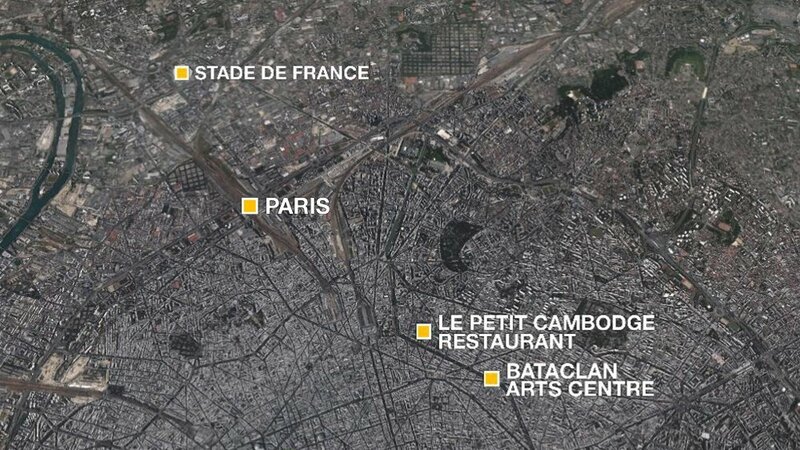 In contrast to the other attack locations closer to central Paris, the commune of Saint Denis is a relatively low-income area where over 35 percent of residents were not born in France. Le Carillon and Le Petit Cambodge are a café-bar and a Cambodian restaurant, respectively, that are located directly opposite one of the city’s oldest hospitals, the Hôpital Saint-Louis. These aren’t especially fancy or controversial places in themselves. They’re fairly typical of the area around the Canal Saint Martin, a traditionally working class area of Paris that has become fashionable in recent decades. The Belle Équipe brasserie is located on one of the busier café and restaurant strips of Eastern Paris. Rue Charonne is one of the main streets in the Bastille neighborhood, an area now almost equally as popular with visitors as with locals. The brasserie itself is a moderately upscale place typical of its area.